While Google is a company built on advertising, for the most part it has stayed out of advertising itself on the dominant medium: television. Yes, there have been those short ads for Chrome and a few for Android that it has been involved with. And Google is even said to have considered an ad during the Olympics, but that was killed at the last second, apparently. But now, it looks like Google may be ready to advertise itself on the biggest stage possible: the Super Bowl. It’s hard to know exactly what he’s saying there, but it would seem to suggest that Google will have an ad that will run during the third quarter of tomorrow’s game. 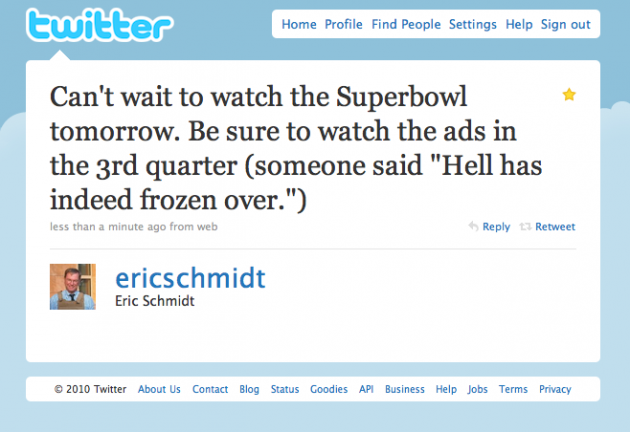 If that is indeed the case, who knows what product it will be for — but the “hell has frozen over” comment is interesting. Could Google be running an ad to promote Google.com itself to counter Microsoft’s Bing ads? We’ll all be watching. Below watch one of Google’s Chrome television ads. Update: After some internal discussion, we think it could be a Nexus One ad (which Google said during its launch event that it wasn’t likely to do outside of the web). Some commenters seem to be agreeing as well. Update 2: John Battelle believes the ad will be about Google “search stories” and singles out this “Parisian Love” ad below.